The simplest method is to make two shaped halves, using the moulded cake tin.However, as with anything new in cooking, practise making your football cake before the actual event to avoid disasters and disappointment, tears and tantrums-the children would be upset, too! Wash and dry the football cake mould before use. Preheat the oven to the required temperature.Approximate guidelines are: 160-170c for Madeira, 180C for chocolate layer cake, 150C for fruit cake. Prepare the moulded cake tin by greasing it first-a pastry brush is very useful for getting into all the nooks and crannies. Stand the greased tin on a baking tray. When the ingredients are suitably mixed, pour the cake ‘batter’ into the moulded tin and pop it into your preheated oven. Approximate guidelines, according to density of cake mix and depth of tin, are: 1 hour for Madeira, 30 minutes for chocolate layer cake, 1 hour 15 minutes for fruit cake because they cook from the outer edge inwards, so the centre is the last place to cook through. Check your cakes regularly without opening the oven door!When the cake is cooked, remove from the oven and leave Madeira or chocolate to stand for about 10 minutes, fruit cake longer. The cake must be cold before you start to cut or decorate it. Butter cream-flavoured with chocolate, thinly spread jam-use whatever is most popular with your children. White sugar paste makes a good background colour for the usual black and grey markings on the football, but use any colour scheme that appeals, especially the colours of your child’s team. Green-coloured sugar paste on the cake board provides an authentic-looking background for the football and an anchor for the cake. Roll out enough to cover the cake board and use a thin layer of apricot glaze on the board to act as an adhesive to the sugar paste. Do this in advance, if possible, preferably the day before. Cover the cake by rolling out the paste to a thickness of about quarter of an inch, then, using the rolling pin to transfer the paste, drape it over the cake. Use your hands to smooth it over and shape the paste to the cake. If the hexagons from the cake mould show clearly, use a piping tube of your chosen colour to outline and fill them. 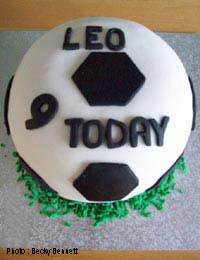 Alternatively, cut out a paper template of the football hexagons (and pentagon on top and bottom)and cut your different coloured sugar paste, or rolled icing, to shape before attaching to the cake.Decorate as little or as much as suits you. Another option is to bake the basic cake, fill and cover, then make a smaller football, or footballs, to go on top. Use icing tubes to mark out a goal and add some edible figures.Same process, less work, but still effective!After all that sugar; how about a game?